John Jones, owner of Sequoyah Caverns and Ellis Homestead, kneels in a section of the cave called the grand ballroom, which has hosted weddings and other events. The attractions are scheduled to close after the Labor Day holiday. The caverns have been a popular tourist destination since 1964. 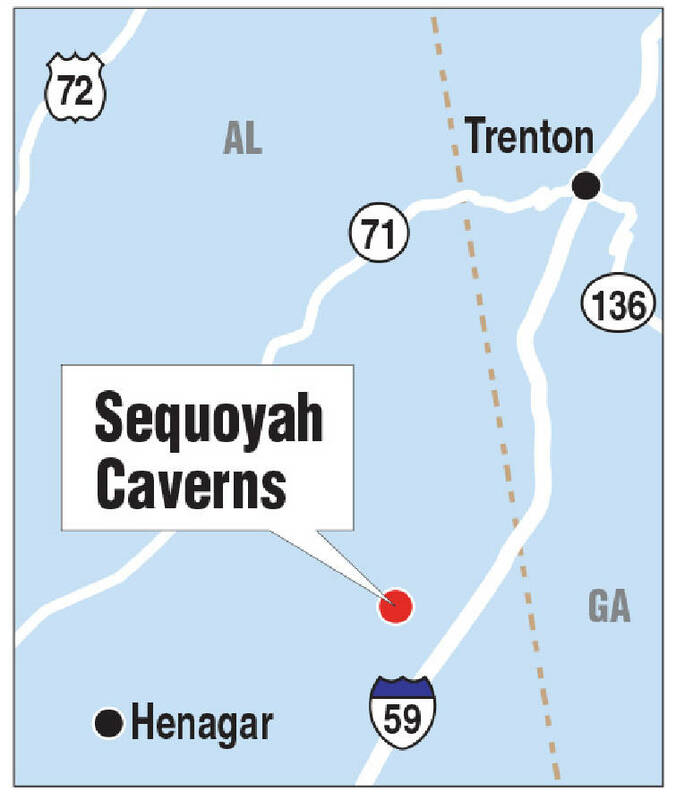 Sequoyah Caverns is in Valley Head, Ala., off of Interstate 59 at exit #239. After exiting I-59, turn east toward U.S. Highway 11 then turn south on Highway 11. Go three miles and look for County Road 731. Turn right onto County Road 731 and go one mile to the entrance. The caverns and homestead will be open today and Monday. Closed Sunday. VALLEY HEAD, Ala. - One of the region's longtime natural and historical landmarks is about to take its final bow. John D. Jones, great-great grandson of original settler James Ellis, will close the doors at Sequoyah Caverns on Monday night, shuttering one of Northeast Alabama's most beloved natural wonders from public view after nearly half a century. Jones, at almost 80, says the phone will be turned off Tuesday along with the website, ending a 49-year-run for the privately owned attraction that was named "Attraction of the Year" in 2006 by the Alabama Mountain Lakes Tourist Association. TripAdvisor.com named it the No. 1 thing to do in Alabama in 2010. This week, a school group of 50 or more trooped through the caverns and out through the gift shop for their bus, one of several hitting the caverns in its final days for one last - or a first and last - visit. Jones said his mother wouldn't let him go in the caverns as a child, but he did start exploring as a teen. Jones' family moved from the property when he was 2 and lived in Macon until they moved back to the homestead in Valley Head in 1953, he said. With the creak of the cavern entrance's iron door, Jones led his small tour group inside, along with "Smart" the dog, so named because Jones' son, Roy, noted the stray had joined the crew some time back and remarked that he must be "pretty smart," the patriarch said. The caverns are festooned with 302 lamps strung on more than 7.5 miles of electrical wiring to show off the geological features left by eons of flowing water and other signs left by humans. As he walks with a memory under every step, he gestures toward the cavern's "giant bell pepper," a "bear," and a "Texas turtle," all formed out of the naturally-shaped limestone with a dose of imagination. The caverns' famous "looking-glass lakes" offer a mirror view of the rock formations above that have grown from the walls and ceilings over the centuries. Stone changes slowly in the cavern but its growth can be noted here and there. Jones said one of the stalagmites and its sister stalactite above it formed a solid column during his lifetime. He pointed to a segment where he said the last four parts of the formation tied the upper and lower sections together. Jones has been the owner since 1998, while the history of the caverns and family homestead reaches back to Jones' great-great grandfather, James Ellis, founder of the site. Ellis moved from Tennessee to settle there in 1841. "My great-great-grandfather who founded it left when the Civil War broke out and took his two oldest sons and went across the mountain to Stevenson, Ala., to join up with the Union forces there," Jones said. "There was a large camp over there. He caught the camp fever and died right there." But Ellis' next-oldest son, Abner, remained behind to take care of the family and pursue the homestead process finally getting a patent for the 120 acres in 1890. Only one of Abner Ellis' children, a daughter, was interested in owning the land, and the land was given to her as a wedding gift, Jones said. That woman was Jones' grandmother, who had four daughters. When she died, the property went to the only daughter who had children, Jones' mother, he said. The property finally went to Jones and his sister, who in 1998 sold her interest in the land to him. The land didn't become a public attraction until the early-1960s when the family was approached by a man who wanted to show the beautiful caverns to everyone. The cave was opened to the public by Trenton, Ga.-born Clark Byers, the man who became famous for painting the region's "See Rock City" barns and had a close connection with the Chattanooga attraction, according to Jones. "A deal was struck - this was about 1962 - and he opened in 1964 and that's when he gave it the name, 'Sequoyah Caverns,' to honor the Cherokee," Jones said. "On geological maps, it's still listed as Ellis Cave." That happened just before Eddie and Shana Romano were born. The Romanos, residents from Hazel Green, Ala., were visiting the caverns for the first time to see them for the last time. "I like nature and I like rocks," said Shana Romano, 45. She wanted to see what the caverns had to offer while she still had the chance. The Romanos' two sons are off in the Navy or they would have been along, the couple said. "It's a sad thing that people are not going to be able to see this," said Eddie Romano, 46. "I loved it and appreciate it," he told Jones as he left. Though the caverns' will be closed as a public attraction, there won't be much change either, said Jones' son, Roy, who has managed the operation with his father. But like his father, he'll reduce his efforts to just taking care of the place for the family rather than as a public attraction. The family now will focus on the farming operation. "Sometime next week after we close, I'll come out here and pull the lawnmower out and cut the grass," Roy Jones said. "The difference is when I get done and it's hot, I can go in there and sit down in the cave and cool off and I won't be interrupting a tour." Contract staff writer Ben Benton at bbenton@timesfreepress.com or 423-757-6569.